Plug & play , No need to cut wires , no need ballasts , but No Canbus Function . Low Power Consumption , Long lasting . 200% brighter than your stock Halogen headlights . Low Voltage Protection , High precision Constant Current Driver Chip . Built in IC Circuit (Current Regulator) - Prevents LED Damage From Voltage Variations & Spikes . Up to 30,000 Hours Service Life . Single lamp 40w , brightness reached 4000LM lumens , the brightest LED headlamps on the market . The new rhombus 4-sided luminous design , 360 ° dead angle , light type is better and more concentrated . Life expectancy more than 30,000 hours , more stable quality , longer lasting performance . Integrated aluminum thermal design , built-in high-speed mute cooling fan , excellent thermal performance , to achieve the best cooling effect . 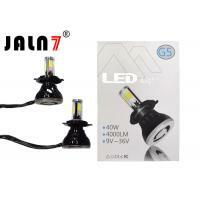 Easy to install , direct replacement of the original car light bulb , plug and play . 9v-36v wide voltage design , trolley car GM . Original car color temperature , more penetrating power . Can choose the color temperature 4300k 6500k 8000k . Aluminum structure , small size , light weight , super waterproof , easy to install one step . Low loss , high brightness , high-tech customized COB light source, energy saving . Brightness without delay 0.1 seconds power that is all bright , driving safer and more secure . 80W Crystal clear 6500K white light 8000Lm (4000Lms per bulb) LED lighting without dark spots ! Improved MHC heat control with RedLine driver and TurboCool fan to ensures your bulbs last longer than your car ! Over 50,000 hrs of brilliant continuous light .